WASHINGTON — President Trump was forced to publicly acknowledge this past week what American intelligence officials said they had long been telling the White House: Even during eight months of blossoming diplomacy, Kim Jong-un, the North Korean leader, was steadily adding to his weapons arsenal and nuclear infrastructure. American officials said the reconstruction there began long before Mr. Trump left Washington in late February for a summit meeting with Mr. Kim in Hanoi, Vietnam, where talks abruptly ended. The rebuilding at Sohae was not the only work underway. While North Korea blew up the entrances to its major underground testing site at Punggye-ri in May, it never allowed in inspectors, as promised, to determine whether the facility had actually been destroyed. Commercial satellite photographs suggest the buildings containing the control rooms and computers used to trigger and study the explosions were carefully mothballed. And in the time between Mr. Trump and Mr. Kim’s first meeting, in Singapore in June, and their second in Hanoi, intelligence estimates suggest that North Korea produced enough uranium and plutonium to fuel a half-dozen new nuclear warheads. The evidence that North Korea was moving ahead with its weapons program was clear, according to American intelligence officials familiar with the briefings provided to Mr. Trump. But the president sought to soften it in public to avoid imperiling negotiations, the officials said. At a news conference late last month in Hanoi, Mr. Trump was still in that mode, suggesting the evidence that North Korea was adding to its ability was ambiguous. “Some people are saying that and some people aren’t,” he said. But for an administration that regularly acknowledges or dismisses intelligence findings to fit the moment, North Korea has served as a comeuppance. Mr. Trump’s aides have been forced to back away from his now famous tweet, issued soon after the Singapore meeting, that “there is no longer a Nuclear Threat from North Korea.” As long as the threat remains, they now say, so will American-led sanctions against Pyongyang. On Thursday, a senior administration official told reporters that the United States remained open to continuing discussions with North Korea. But the official asserted that sanctions would not be lifted until all the threats were removed — which he defined as the North’s entire nuclear program, complex of road-mobile missiles and chemical and biological weapons programs. That is a far broader demand than the Trump administration has previously detailed in public, and was at the core of the collapse of the discussions in Hanoi. Mr. Kim had offered to close an aging nuclear plant at Yongbyon in exchange for the lifting of some of the toughest sanctions imposed on North Korea. To his surprise, Mr. Kim was told that the United States would not lift all sanctions until the North surrendered its entire weapons program. By all accounts, Mr. Kim believed Mr. Trump was desperate for a deal and would accept a more gradual approach — a partial disarmament leading to partial sanctions relief. Unable to bridge the gap, they walked away, though Mr. Trump insisted they agreed to continue talking. No further negotiations have been scheduled. North Korea, for its part, is using its continued production of nuclear material to pressure Mr. Trump — making clear its ability to pose a threat will only grow unless the United States eases its demands. The White House and State Department say that is not the case. The continued moratorium on nuclear and missile tests, officials said, has slowed Mr. Kim’s progress and kept him from demonstrating that North Korea could launch a warhead that could hit an American city. Some independent analysts agree with the Trump administration’s rationale, but worry the moratorium may be coming to an end. North Korea’s satellite launching site at Sohae, on the Yellow Sea, offers a case study in the deep ambiguity of the dismantlement and denuclearization claims by both sides. The site is important because the North has test-fired powerful rocket engines there on a giant experiment stand and, at the nearby launching pad, successfully cast two satellites into space. The United States has declared that space launches violate the commitment that Mr. Kim made to Mr. Trump in Singapore, and later to President Moon Jae-in of South Korea, to suspend all missile and nuclear tests. Modern and comfortable, with a high observation station, the site represents the jewel of North Korea’s rocket agenda. Analysts say the engine test stand played a major role in developing the fiery thrust for the North’s intercontinental ballistic missiles, whose repeated launchings in 2017 terrified the world. That enthusiasm proved premature. For the next eight months, analysts poring over satellite images of the densely wooded site at Sohae found little evidence of dismantlement. No major structures were changed, destroyed or disassembled. Instead, the images showed the opposite: evidence that North Korea was completing work on an extensive building complex next to the launching pad at Sohae. Rather than disassemble the site, as Mr. Kim had promised, it was expanding. “We all watched it go up and kept wondering, ‘What is it?’” recalled Jenny Town, a senior official at 38 North, a research project and website of the Stimson Center, a Washington think tank, which tracks political and technical developments in North Korea. They are still wondering. No one is certain about the purpose of the structure — or if it has an intent other than to stoke fear in the United States. This past week, 38 North and Beyond Parallel reported that reconstruction at the Sohae site had greatly accelerated. “Based on commercial satellite imagery, efforts to rebuild these structures started sometime between February 16 and March 2, 2019,” 38 North said in its report on Tuesday. 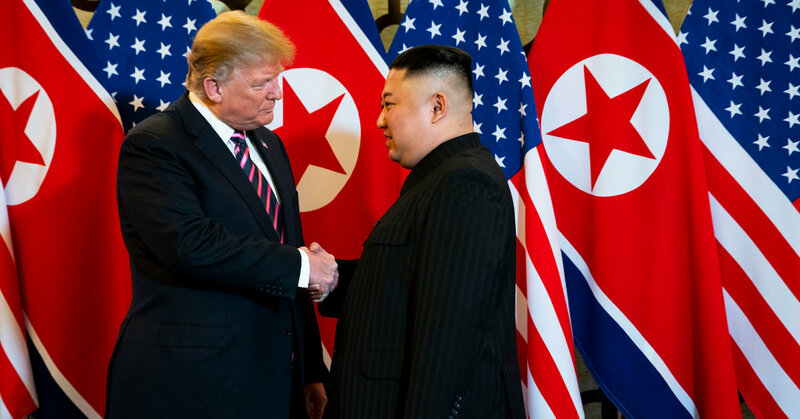 The summit meeting in Hanoi began on Feb. 27 — suggesting the construction was intended to give Mr. Kim some leverage in his talks with Mr. Trump. As of Friday, administration officials were telling allies they still did not know if North Korea planned to resume missile launches at Sohae. But Mr. Trump no longer denounces news reports of expanded missile bases or revived test sites as “fake news,’’ as he did before the meeting in Hanoi. In late January, the president even called in the director of national intelligence, Dan Coats, and the director of the C.I.A., Gina Haspel, to demand they pull back recent public declarations that North Korea was not likely to ever give up its entire weapons arsenal and production facilities. Two days later, Mr. Trump said the problem lay not in the intelligence officials’ testimony but in the news coverage about it. One senior official later said the deflection was “all about avoiding criticism of Kim.” The official spoke on the condition of anonymity because the president’s meeting with the intelligence chiefs was intended to be private. Ms. Town said the satellite site expansion and rebuilding at Sohae reminded her of a similar episode at the Yongbyon nuclear research center, the main known site for the processing of fuel for nuclear weapons. Last year, North Korea finished building a large facility across from Yongbyon’s experimental light water reactor. Analysts believe the reactor could double the North’s supply of weapons-grade plutonium, producing more fuel for its nuclear arsenal. Then there are the headquarters at Punggye-ri’s mountainous atomic test site — a mile-high peak full of tunnels where North Korea has set off its nuclear detonations. In November, 38 North analysts reported that, contrary to reports of the site’s destruction and abandonment, the two largest buildings at Punggye-ri’s command center remained intact, as did nearby support facilities for personnel and security forces.